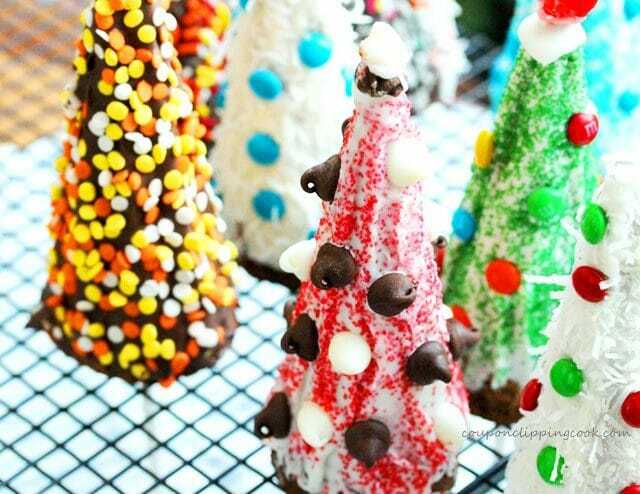 These edible Christmas trees are totally unforgettable. 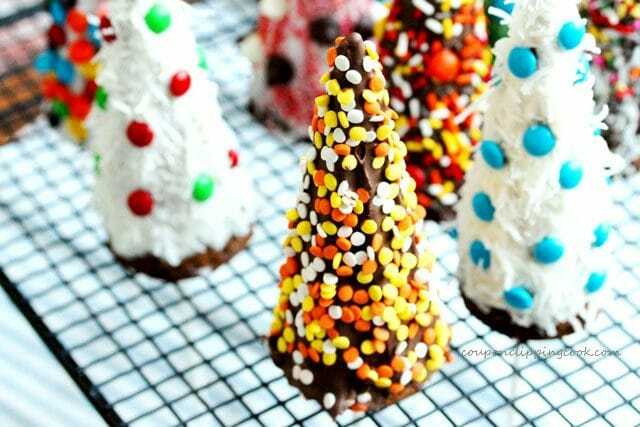 Each one of these unique candy coated Christmas trees are on a lollipop stick and not only have decorations on the outside but are filled with something sweet and slightly crunchy on the inside. These adorable trees start their life as a sugar cone and just get better and sweeter from there. …a cookie. The sugar cone is filled with cookie dough and baked in the oven. Then chocolate chips are added to the warm baked cookie, and a lollipop stick is put in at the “base of the tree”. Once the cookie and chocolate chips cool, the lollipop stick is ready to be handled and the Christmas decorations can begin. 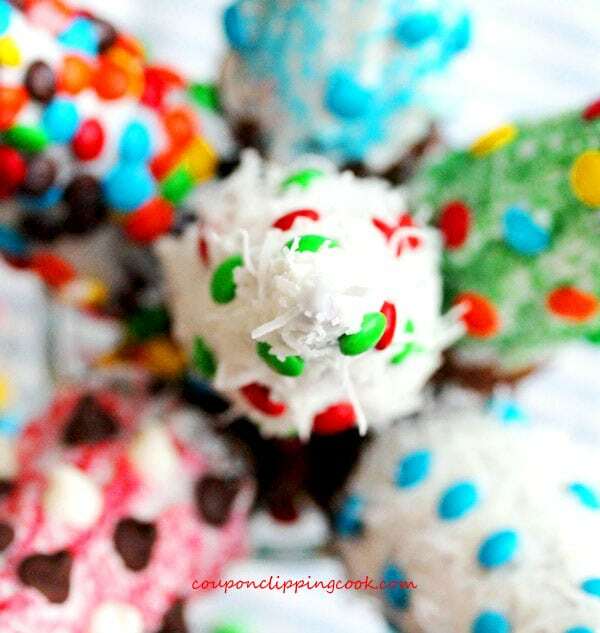 These Candy Cookie Cones can be customized for any event or holiday. Although I didn’t use it in my examples, candy corn would be a perfect topping to add this time of year. 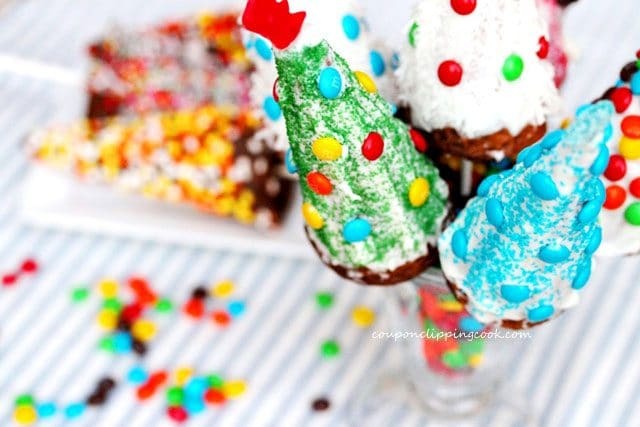 Sugar cones, premade cookie batter, chocolate chips, candy coating (Almond Bark), candy decorations (such as candy sprinkles, M&M’s, or shredded coconut) and long-size lollipop sticks. First, remove the top rack in your oven so that when the sugar cones filled with cookie dough are baking, they won’t be too close to the top of the oven. Remove the sugar cones from the package and put them in an upright dish for easy handling. A sundae dish or tall mug works well for this. Add about 1 tablespoon of cookie dough into the bottom of each sugar cone. I used cookie dough from a recent recipe I made called Chocolate Toffee Caramel Cupcookies. 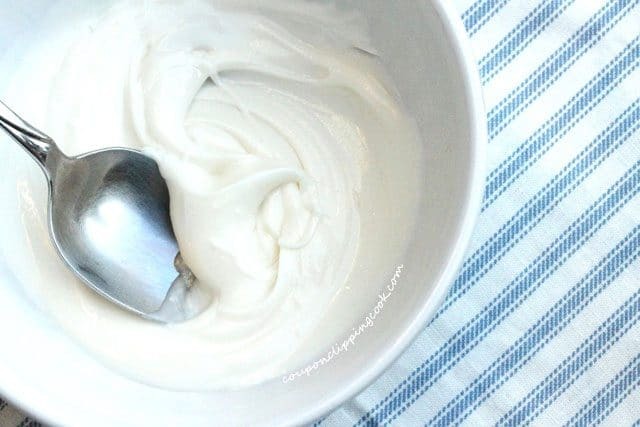 You can also use premade refrigerated cookie dough generally found in the dairy or deli refrigerated section of the grocery store. The dough should fill about ½ of each sugar cone. The empty space that’s left at the top of the sugar cone should be enough room for the dough to rise (if there is too much dough in the sugar cone it will run over the sides in the oven). 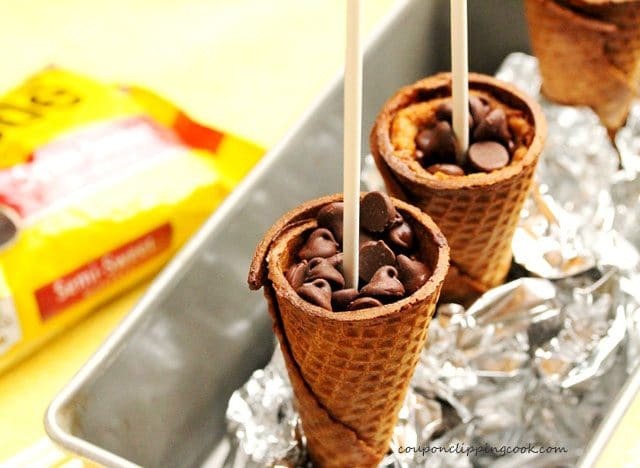 Set the cones aside while you prep the foil. 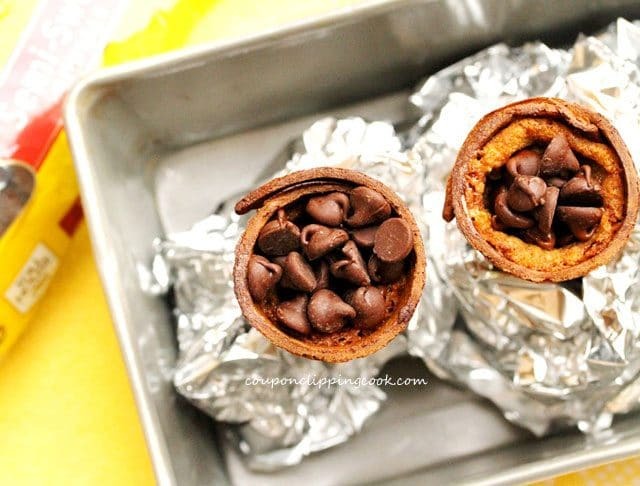 Squeeze each piece of foil into a tight donut-type shape with a small inner circle so that the tip of the sugar cone will fit tightly in the middle of the foil. Lay each piece of crumbled up foil at the bottom of a bread loaf pan. Add the sugar cones bottom side down (with the pointy side down) into the foil. 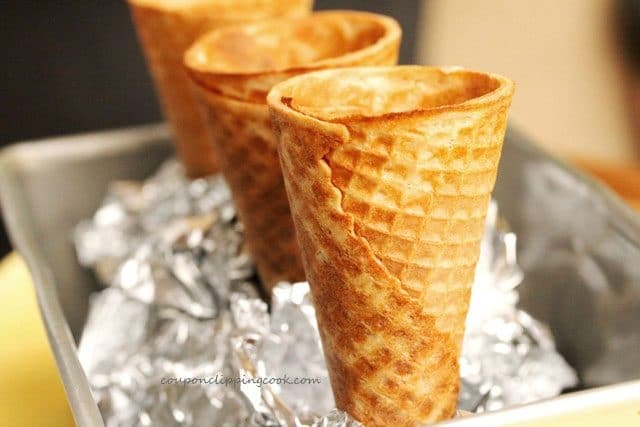 Squeeze the foil tightly around the cones so they stand up straight. Add more crumbled up pieces of foil in the bottom of the pan if needed to prop up the cones securely. If you’re baking a few of the sugar cones at a time, a bread loaf pan works well; or if you’re baking all of the sugar cones at one time, a large pan with similar depth such as a roaster pan works well. Bake in a preheated oven for about 18 minutes or until the cookie dough is cooked. Keep a close eye on the sugar cones to make sure the tops don’t burn. When the cookie cones are done, remove them from the oven. 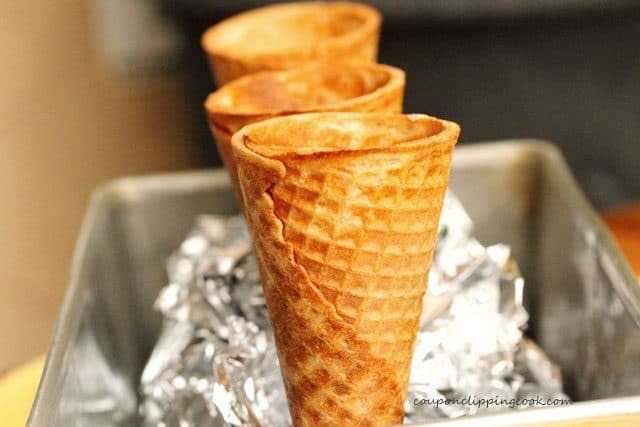 Leave them in the baking pan and while they are still hot, add chocolate chips in the middle of the cone all the way to the top of the cone. 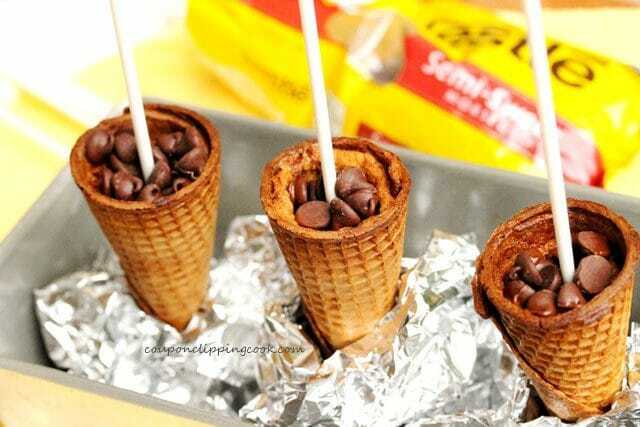 Then add a lollipop stick in the middle of each cone poking it through the chocolate chips and the soft cookie. 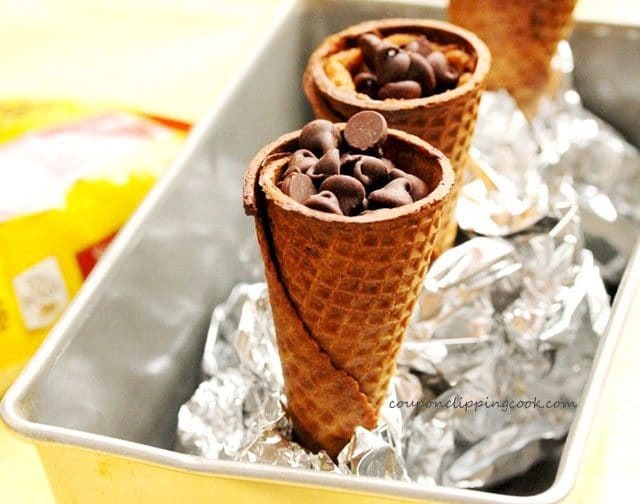 …let the cookie cones cool completely while still in the baking pan. Add the candy coating to a small bowl and heat it in the microwave for 25 seconds. Stir to move around the unmelted pieces. Then heat it for another 25 seconds and give it another stir. If it still needs more time heat it for another 10 seconds. 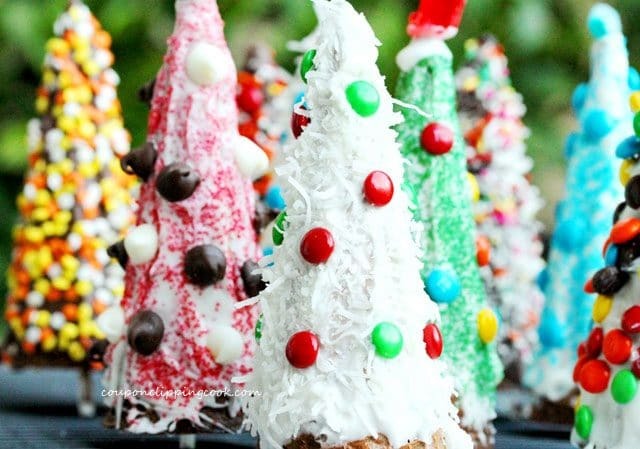 TIP – Decorate one cookie cone at a time so that the candy coating will be warm enough for the candy decorations to stick. 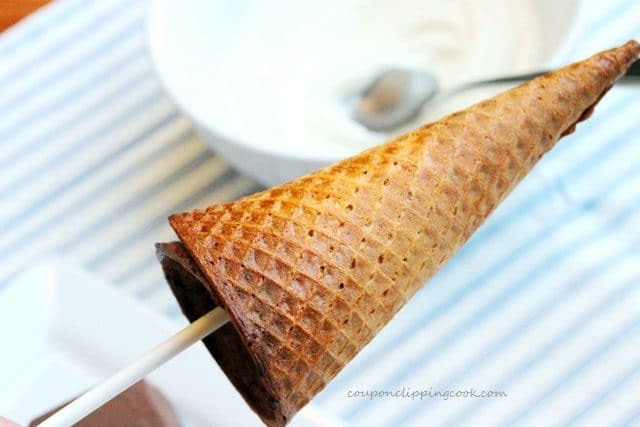 Hold the cookie cone by the stick in one hand and with the other hand dip the back of a small spoon in the candy coating and spread it on to the sides of the cookie cone. Spread it on a bit thick so that there is enough area for the candies to stick. Then immediately add the toppings to the candy coating so they will stick. 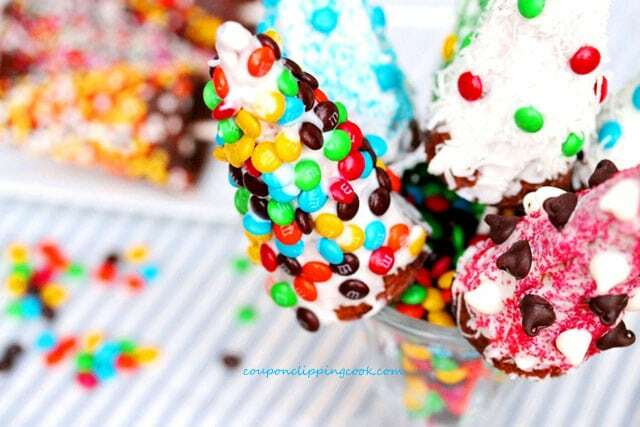 Let the candy coated cookie cones completely cool. 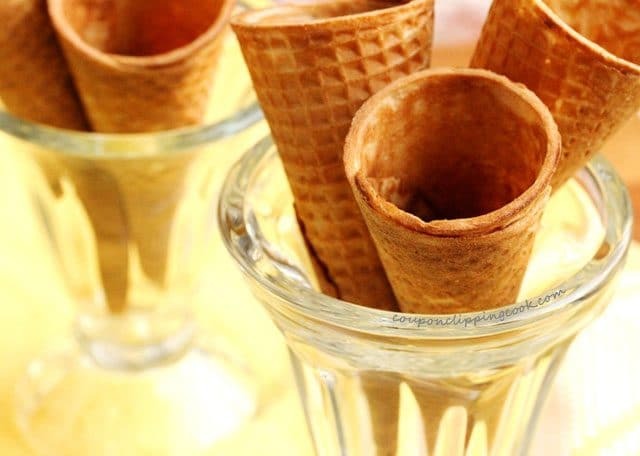 TIP – Some options for storing the cookie cones while they cool are to put them stick side down in a tall mug, medium size glass, sundae dish, or in between the holes on a cooling rack stand. Thank you so much for stopping by CCC. Remove the lower rack in the oven so that the sugar cones filled with cookie dough won't be too close to the top of the oven when they're baking. 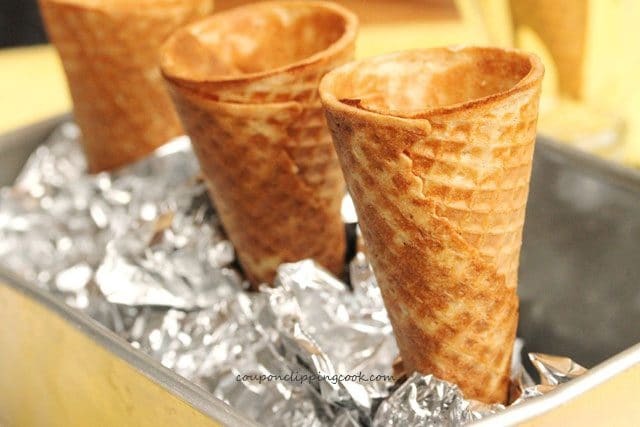 Remove the sugar cones from the package and put them in a tall upright dish for easy handling (open side of the cone facing up). A sundae dish or tall mug works well for this. 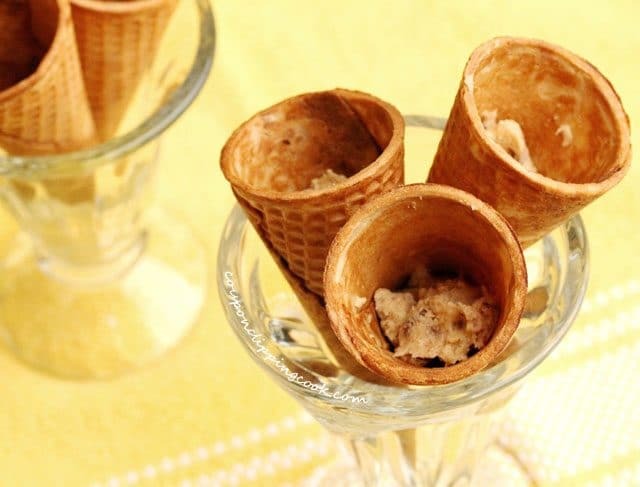 Add about 1 tablespoon of cookie dough into the bottom of each sugar cone. The dough should fill about ½ of each sugar cone. The empty space that's left at the top of the sugar cone should be enough room for the dough to rise (if there is too much dough in the sugar cone it will run over the sides in the oven). Set the cones aside while prepping the baking pan with foil. 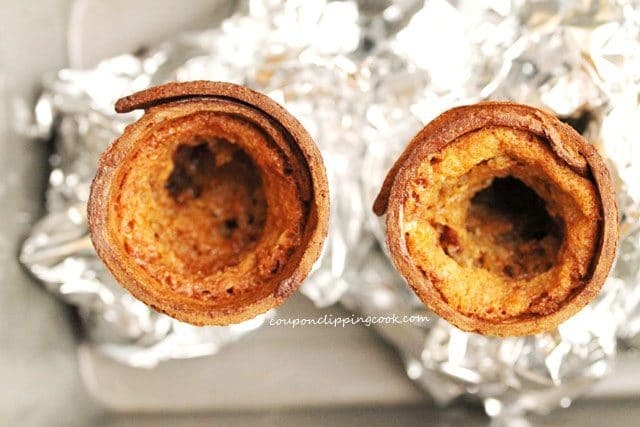 Squeeze each piece of foil into a tight donut-type shape with a small inner circle so that the bottom tip of the sugar cone will fit tightly in the middle of the foil. Lay each piece of crumbled up foil at the bottom of a bread loaf pan. Add the sugar cones bottom side down (with the pointy side down) into the foil. 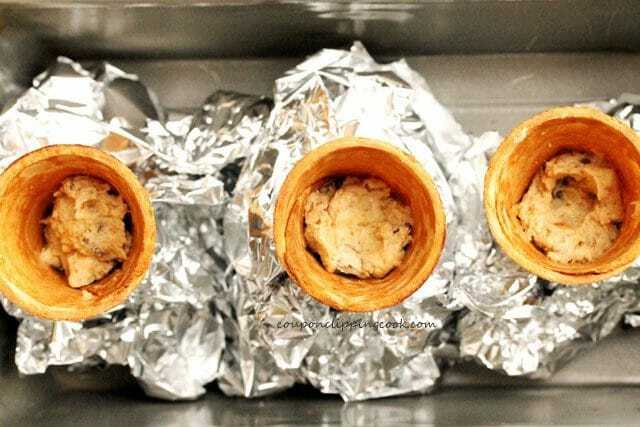 Squeeze the foil tightly around the cones so they stand up straight. Add more crumbled up pieces of foil in the bottom of the pan if needed to prop up the cones securely. Bake in a preheated oven for about 18 minutes or until the cookie dough is cooked. Keep a close eye on the sugar cones to make sure the tops don’t burn. 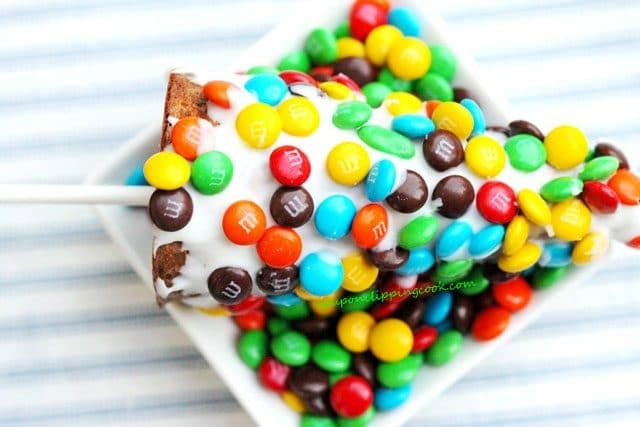 Then add a lollipop stick in the middle of each cone poking it through the chocolate chips and the soft cookie. Let the cookie cones cool completely in the baking pan before adding the decorative toppings. Add the candy coating to a small bowl and heat it in the microwave for 25 seconds. Then with a small spoon, stir just a little to even out the unmelted pieces. Then heat it for another 25 seconds and stir until creamy. If it still needs more time heat it for another 10 seconds. 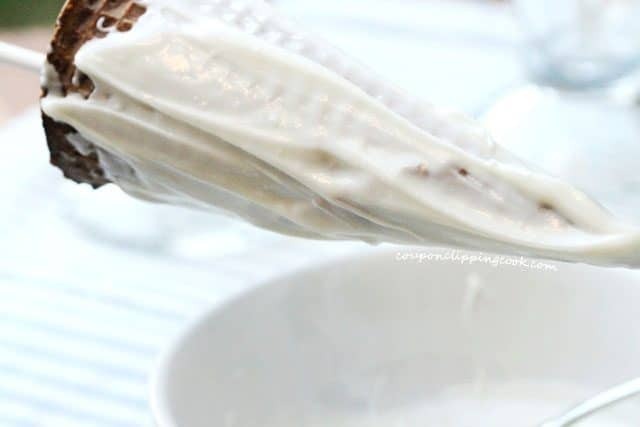 Hold the cookie cone by the stick in one hand and with the other hand dip the back of a small spoon in the candy coating and spread it on to the sides of the cookie cone. Spread it on a bit thick so that there is enough area for the candies to stick. Then immediately add the toppings to the candy coating so they will stick. 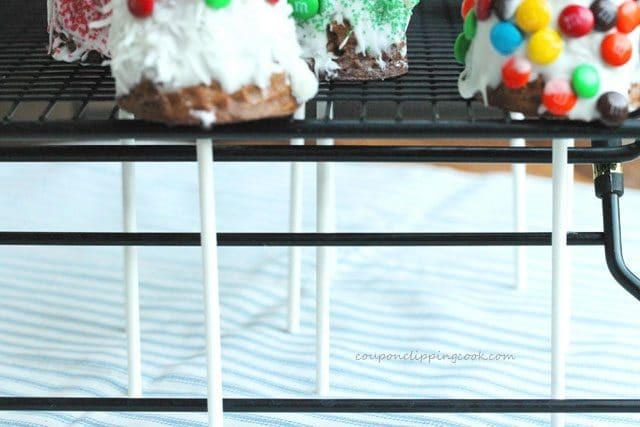 Some options for storing the cookie cones while they cool are to put them stick side down in a tall mug, medium size glass, sundae dish, or in between the holes on a cooling rack stand. 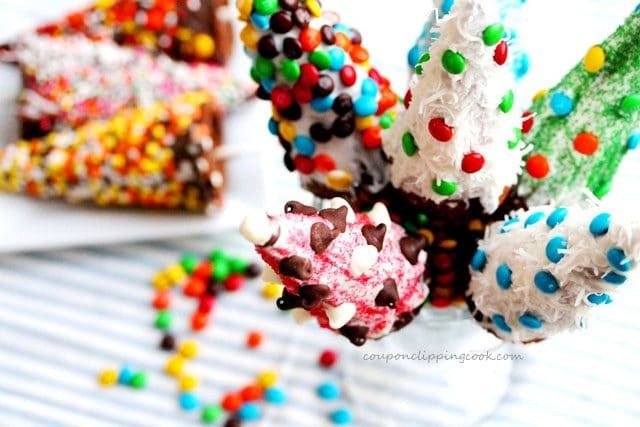 Let the candy coated cookie cones completely cool before serving. 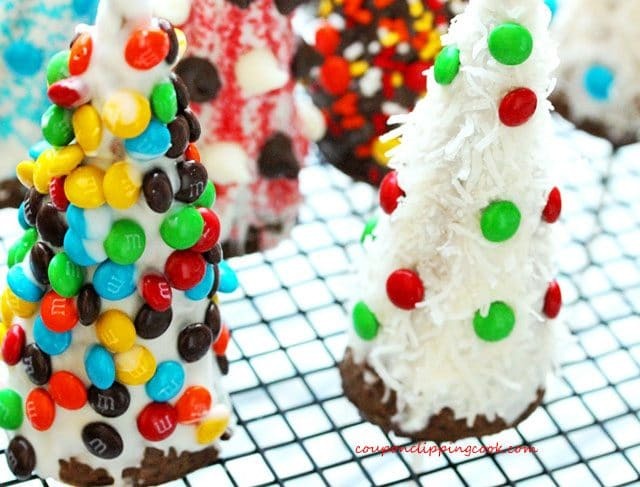 Decorate one cookie cone at a time so that the candy coating will be warm enough for the candy decorations to stick. 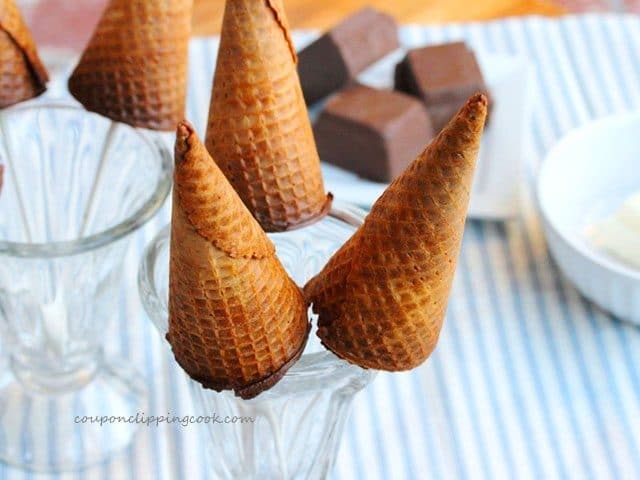 Some options for storing the cookie cones while they cool are to put them stick side down in a tall mug, medium size glass, sundae dish, or in between the holes on a cooling rack stand. These are just too cute!!! I think i will make them for my son’s class. I just have one question….will the chocolate chips melt and harden or when you turn them right side up will they try to fall out? This is the only part i was unsure about but i may have just missed something. Hi Leona, thank you for your comment and good question. The candy coating goes on pretty thick. 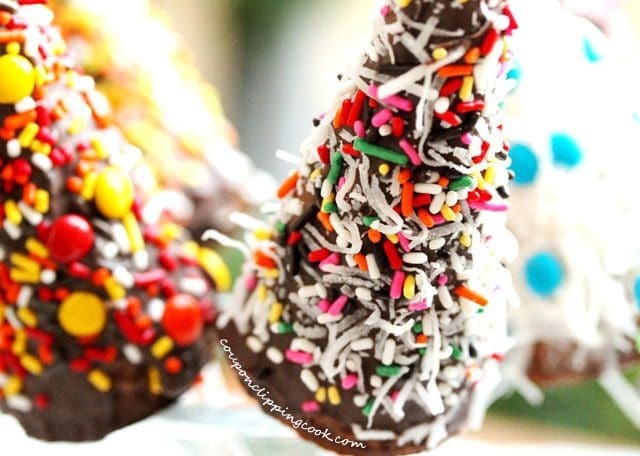 It’s thick enough to hold on to the chocolate chips so that they can dry nicely where they are placed on the cone (the chocolate chips or lightweight candy decorations shouldn’t slide unless the candies are more on the heavy side like perhaps lifesavers or small gumballs). Thank you for stopping by! Thank you for this great idea! How about the chocolate chips inside the cone? Don’t they fall out when you flip the cone? Hi Evelina, great question. The chocolate chips are added right after the cones (with the cookie dough inside) come out of the oven. There should be just enough heat as the cookie dough cools to melt the chocolate chips so that the lollipop stick is secure. Thank you so much for stopping by. This would make some really cute Santa hats with red melts and white sprinkles with a marshmallow on top. Hi Cathy, what a cute idea! The Santa hat sounds adorable. Love the idea of the marshmallow top too. Have a great rest of the week! How long are these good for after made? Hi Jess, I actually left them out on the counter in the kitchen for about a week in between taking photos of them. I set them in coffee mugs with the stick end down and wrapped them in cellophane. They lasted nicely for about 4 days I believe it was and then the colors on the candies started to fade a little. They weren’t as shiny as the first few days after they were made. But they still tasted great. Thank you for stopping by! These look great – although being in the UK we dont have ready made cookie dough (that I am aware of). Is it cookie or cupcake batter? I am presuming cupcake, so a sponge texture rather than biscuits as biscuits would be too hard surely? Hi Stephanie, it’s cookie dough that is baked inside of the sugar cone. In the US the pre-made cookie dough is generally kept in the refrigerator section at the grocery store by where the pre-made biscuits are (the kind in the tube-shaped packaging). But maybe the markets where you are don’t have this sort of thing. The cookie dough works well to hold the lollipop stick in place. I’m not sure if cake batter would be strong enough to hold the lollipop stick but maybe it would work if the cake was more dense like a pound cake. Now that I mention it, your thoughts of cake batter sound really good in this recipe. I do agree that biscuit batter may be too hard in the cone. 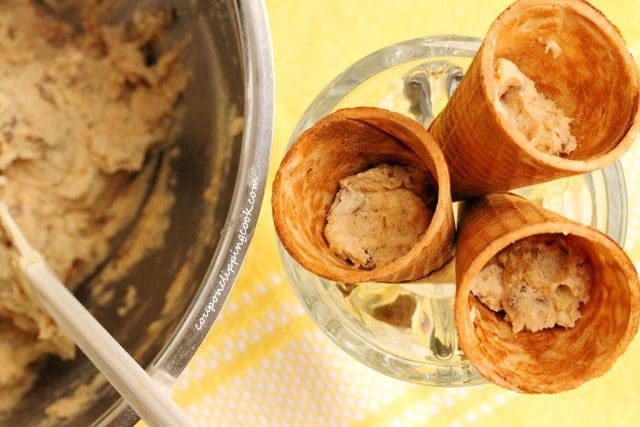 Would it work for you if you used a basic cookie dough recipe and cut it in about a third so it’s just enough dough to fill the cones. Maybe a sugar cookie recipe? Thank you so much for stopping by! Wonder if it would be ok to use icing on the outside instead of melted chocolate? Hi Kim, great question. 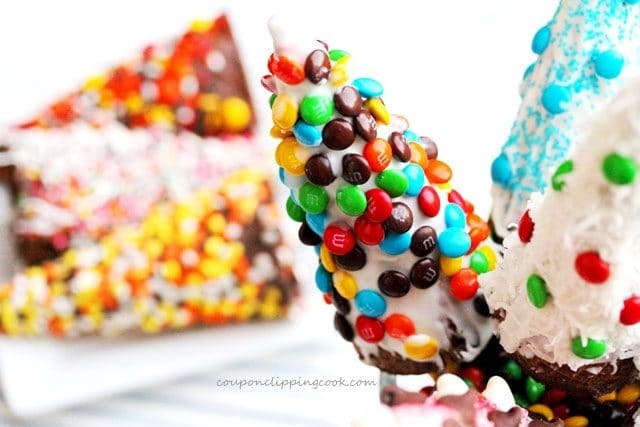 I’m not sure if the frosting would adhere to the sugar cone but it would be worth a try. It sounds delicious! Thank you for stopping by and have a great weekend! 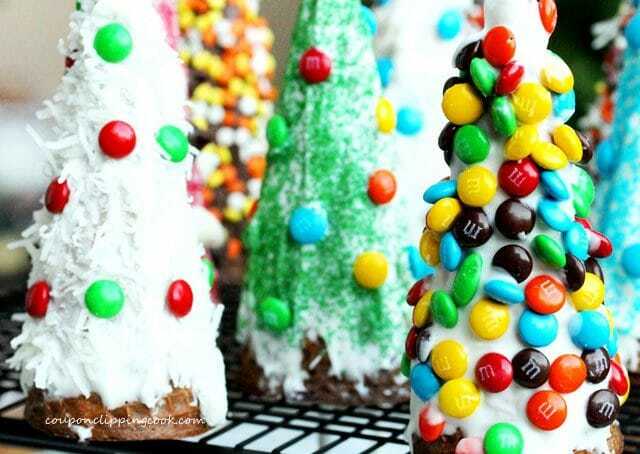 I pinned this on pinterest just thinking what a great way to make Christmas “trees” instead of doing gingerbread houses. I had no idea there is cookie dough in there. I mean can you get better than this?! I can’t WAIT to make these. Hi Jen, thank you for pinning this on pinterest. Yes, there is a bit of cookie dough added for a surprise under the Christmas Tree! And also so that the lollipop sticks would have something to hold on to. I hope you enjoy them. Thank you for stopping by and have a nice weekend! Thanks so much for sharing these! I love them! I found you via Pinterest and have included you on my top 10 Pinterest Christmas Recipes. Hi Kali, thank you very much for including this recipe on your top 10! And Merry Christmas to you too! Wow, beautiful idea, I have to remember this for this year’s christmas! Hi Leonila, sounds like a great idea for your grandbaby’s party. Thank you for the mention Boston Interiors Blog! 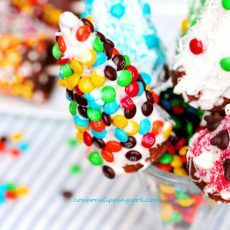 Hi Christen, thank you so much for including these Candy Cookie Cones on your blog! I hope your kids enjoy making them! Have a great weekend. Hi. I love this idea. I used it on my website and linked back to you. Thanks for the inspiration. Hi Jennifer, so glad you like it. Thank you very much for putting this on your site. Love your site by the way! How creative this is! I am sure you had a lot of fun making these and I love the end result. 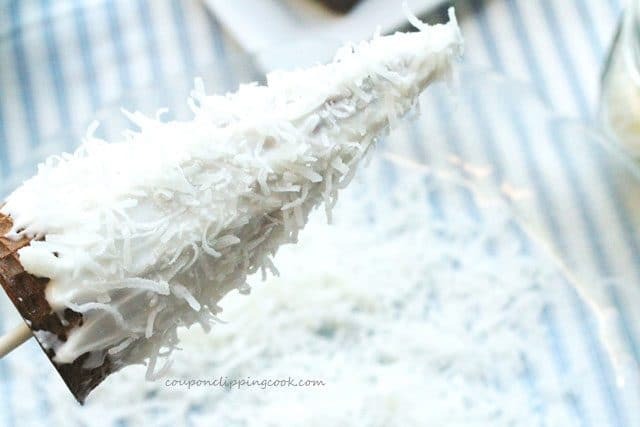 I have saved this recipe-great for little ones at Christmas. Buzz Buzz! Hi Tina, thank you! It was a lot of fun…my only problem was that I kept snacking on the ingredients…but that’s a good problem to have. That is just awesome! Soooo super creative! I love it!! Hi Kate, thank you very much! Have a great weekend. Love these! So fun and colorful! Awesome job! Thank you so much! Have a great weekend.